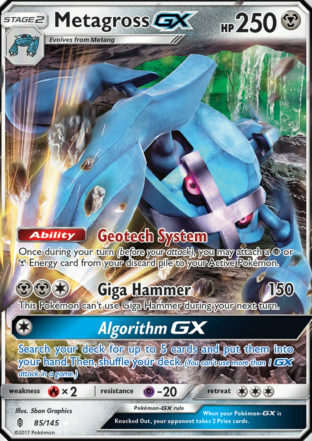 These days I’d like to believe that almost every Pokemon Player online has seen, heard, or has played with Metagross GX in some way, shape, or form. It was an incredibly underrated card back during the days where Guardian’s Rising was being leaked. And then it performed well; Alolan Vulpix with Beacon allowed you to find your evolutionary pieces, and if you had the Rare Candy on hand you had the Metagross ready to go with Algorithm GX, which many opponents tried to deny by using N of course. And while 150 didn’t seem so nice at first, Choice Band and Dhelmise made it to where he could hit the magic numbers that would otherwise elude this guy. It saw play here and there in a variety of ways, and 250 HP was a huge wall to go over when facing this guy. Recently however, Metagross took took 4th place at the Philadelphia Regional awhile back. Piloted by Aaron Rucker, he added in Solgaleo GX for not only extra firepower, but also the ability to swap around attackers for offense and Guzma plays as well. I won’t lie, I thought at first this was going to be a challenging deck to play with, given that you were running two Stage 2’s and we all know how stage 2 decks can go. What I found, however, was that this deck was incredibly consistent more often than not. Given that you had 4 copies of Nest Balls and Ultra Balls each, a player got many opportunities to get the board up and running turn 1. On the perfect days, you could have down your Cosmog and a Beldum or two and proceed to Steven’s Resolve to produce whatever you needed at the time, whether it be a Rare Candy/Metagross/Draw supporter play, or any other combination of cards you wanted for the following turn. 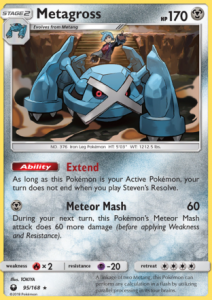 Steven’s Resolve after turn 1 might not be so good, but that’s why the deck runs a single copy of the new Metagross, who’s ability allows you to use Steven’s Resolve without ending your turn (so long as you don’t forget to have him out in the active). With such a combo, you could actually get up many more attackers with that play, and proceed to have a solid board ready to go with Solgaleo leading the way. And Alolan Vulpix is there just in case you need Beacon, a fantastic setup ‘mon for many decks indeed. The draw supporters here are fairly straightforward, as they all help to keep your resources up, and Guzma is Guzma: a card we definitely cannot go without in any future format (well okay they could always bring back Lysandre, but it wouldn’t be the same anymore). Anyways, the goal of the deck is very simple: get up as many Metagross as possible, while having Solgaleo up as well. Once you get it going, it becomes an uphill battle for opposing players because even when faced against Shrine decks, they will have a very difficult time dealing with several attackers here, given that the high Hit Points of these ‘mons gives you more than enough time to sweep the opponent. Furthermore, with 4 Max Potions in the deck, you can literally wipe away all the damage the opponent has done to your Pokemon, and if you get the feeling that Shrine damage is bringing a key player to the OHKO range, simply Max Potion up that ‘mon as well and you’ll be okay. In my experience with this deck, I wanted to keep my Solgaleo healthy more than anything else. You only run 2 Choice Band so having three Metagross on board allowed for Sunsteel Strike Spamming over and over again against GX decks, while Metagross and support from Dhelmise allows you to deal with almost all relevant non-GXs out there (Garchomp can hit hard, but against this deck he is but a glass-cannon. He can be dealt with). Now as demonstrated by 21Times recently, Altaria GX can severely hinder this deck if you do not manage your resources well. Against that deck, Guzmas are important and you cannot afford to waste them so readily. And given that things like Hoopa and Alolan Ninetales are around, it does get a bit tricky to face these anti-GX walls in a sense. But in this deck, we have baby Metagross and Dhelmise for those types of threats. For example, Metagross’ Meteor Mash attack starts off at base 60, but goes up to 120 the following turn (so long as he does not leave the active spot), meaning that things like Hoopa get 2HKO every time, and Alolan Ninetales just gets smacked up. As for Altaria, add in Dhelmise and now you start off at base 70 doing 130 next turn, hitting the magic number of 200 within 2 turns without fail, or sooner with a Choice band. And at 170 HP, this guy is no pushover: he can get the job done. Last thing to touch on is the fact that this deck does run a single Psychic energy: if worst comes to pass, Dhelmise can act as a non-GX attacker as well. He’s a Psychic type attacker, so things like Buzzwole are not safe from him, and a Choice band delivers punishing amounts of damage to many other threats. Do not hesitate to play him as your backup attacker: he can provide a bit of flexibility if you find yourself in a dilemma against anti-GX decks. To wrap things up, I can’t say this is an easy deck to pilot: you have to know what you’re doing and who you are facing off against. It’s a deck that feels like a jigsaw puzzle or some sort of construction project, but once it goes up, the satisfaction is guaranteed. 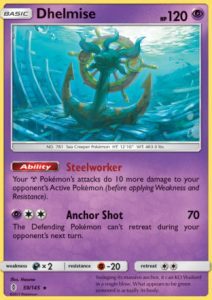 For Metal type challenges on PTCGO, there is no other deck I can recommend than this one right here: it is very much the deck that can finish evolution and damage challenges within 2 games, and if you are bold enough to do the 16 knockout challenge, well here’s a solid pick. Trust me: Metagross/Solgaleo is definitely a good deck, no questions asked. Editor’s note: In the eight matches I played against GX decks with Altaria GX, Metagross Solgaleo was the only GX deck that actually beat me. Wow, Juan, you got to be a feature writer? That’s pretty stinkin awesome, if you ask me! And this definitely seems like an awesome deck, just got to pick up some space lions and I’m on the way. And also.. 21times, I tried out Blaziken/Turtonator/Turtonator GX, and the list works really well. Ho-Oh Salazzle works pretty nice too in this current format. Red_Ninja_Red If you ever have a good day where you just wanna write your heart out for a decklist, you are definitely more than welcomed to write as 21Times said. Basically this website can become like a forum of sorts where you can read up and enjoy some brainstorming, like checking out a list and thinking to yourself, “maybe adding these cards could make it work nicely”. Also Solgaleos are fairly cheap to get: with about three reprints and even appearances on the Ladder online, you won’t struggle to get them. And thank you Harvey for publishing the article: it’s good to have a moment of inspiration. Thanks Red if you come up with a good article let me know and we’ll publish it. The goal of this website is to publish multiple articles, deck reviews, video summaries, studies, etc. per day. Basically, if you have a decklist you want to share, we’re more than happy to put it up on the site. Even more, if you have a scientific analysis related to the game, we would absolutely LOVE to publish that too. Honestly, I’m looking for good stuff to read on the bus or while I’m eating breakfast or waiting for ballet to finish. I can’t find a site that really puts out multiple good articles on decks that are relevant to the game right now (at least not one that’s free) or cutting edge theorymon that has some statistics or evidence to back it up. That’s what I hope this site becomes one day. MarquisEXB did a Cincinno list some months ago. You’ll have to dig but you can find it on the site here. I think it lost a lot with Bursting Balloon leaving the format. Thank you for the compliment! My advice for you would definitely be to check out the decks that were played in tournaments on limitless tcg. It helps to give you an idea on what you might face in the ladder that week (potentially), or even inspire you to take a list and make it even better than what you got. I do know one thing: I am not touching that Sylveon deck. I just can’t. However, that Decidueye Zoroark and Passimian decks that were played in the Offenbach regional…now those two caught my eyes, alongside Lugia/Malamar and the other stall deck: Steelix/Hoopa/Wailord….understandably, we have here an anti-GX wall and two stage 1’s, with 190/220 Hp respectively that can reach bloodboiling levels to where the opponent really isn’t going to knock them out without a fight. But I will say this: the real life meta won’t always match up to PTCGO; On my end, there’s fewer and fewer GX decks facing me, and Zoroark isn’t common as it used to be, which is weird but I guess it’s just the players I’m matched with at the given time. 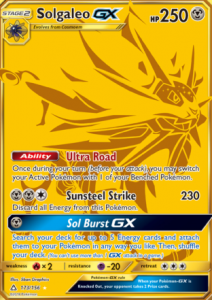 As for the Metagross/Solgaleo deck: I feel that this is one of the very few decks out there, besides something like Empoleon/Swampert, that can run two stage 2’s in such a consistent way: Steven’s Resolve, Vulpix, Algorithm GX…if Metagross did not have Algorithm GX, it would probably be a bit more tricky to pull off. And likewise: Ultra road is a pretty underrated ability. Hah I was going to do a feature article on Sylveon next week. I think there are too many Squids and Blaziken decks on PTCGO for it to work though. It was perfect for that meta last weekend. It’s pretty interesting tho isn’t it: How the online meta isn’t like the card game. In real life, Zoroarks are prolific, Ray is out there, and then you have the dashing of surprise here and there like Sylveon and the new wall deck. But in the online game alone: I found Lurantis/Bulu, Beast raid, Empoleons, Gardys, Honchkrow….basically you don’t see the same decks too often, which is pretty relaxing. On another note: Lugia GX and some other english version of some Lost Thunder cards were revealed…and I learned what the word Pelagic is, and I’m loving how I’ll slap him into my Malamar deck in a month’s time: he’s pretty fun.